GG has written a few times about the state of oil and gas regulations here in Colorado. A lot of that is now changing as Senate Bill 181 has passed the Colorado Legislature and heading for the governor’s desk, where it is expected to be signed. As is typical these days, the public debate was overheated. Claims that passing this legislation would end petroleum development and cripple the Colorado economy were broadcast in commercials, while some advocates felt that the bill didn’t go far enough and were upset when amendments loosened some of the language of the original bill. Others felt that this was overturning the voters’ rejection of proposition 112 last fall (e.g., comments here). Votes in the legislature were along party lines. So is this the death knell of oil and gas in Colorado? Best to see what passed rather than rely on public pronouncements. So let’s look at what is in here. Does Madame Pele Like Geothermal Energy? Hawaii lore is full of stories about trying to get lava flows to stop. The US Army Air Corps tried bombing flows, Princess Ruth was credited in 1881 with saving Hilo from a flow, the Mauna Loa observatory high on the volcano comes with levees built to deflect lava flows. Perhaps another chapter was written within the devastating eruption of 2018…. GG had the good fortune to visit Hawaii recently and of course had to check out the flows from the 2018 eruption. One spot visited was near the Puna Geothermal Venture (PGV), a geothermal energy plant run by global geothermal company Ormat Technologies that supplied about 25% of the Big Island’s electricity before being shut down as the 2018 eruption intensified. There were a few surprises. First, though, what is remarkable is that there is a plant to discuss at all. The location of the plant was chosen for proximity to magma–indeed, one of the wells drilled actually tapped magma directly (not ideal for geothermal work). 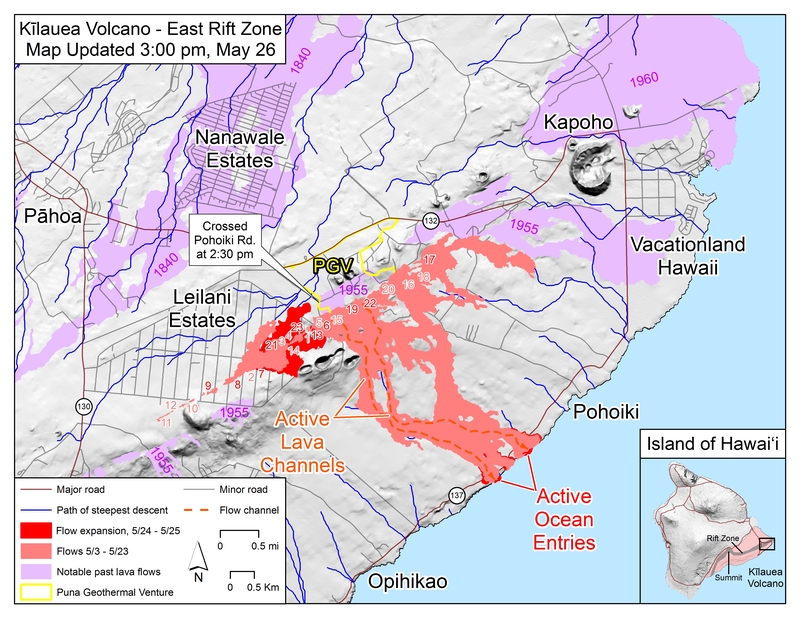 When the fissure system of the Lower Puna eruption began in May of 2018, the plant (placed on a 1955 flow adjacent to the cinder cone of Puu Honuaula) began capping wells and draining the fluid used in the closed-system geothermal heat exchangers. Initially it probably seemed as though this would prove unnecessary as the initial long flows starting on 19 May from the eruption headed south, away from the plant. 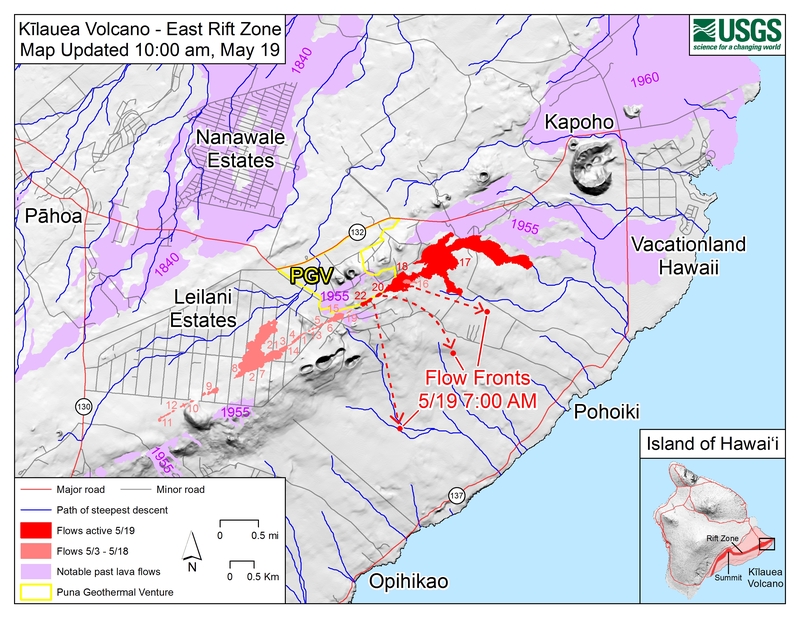 Those flows went south to the ocean, but late on May 25th flows began descending the north side of the East Rift Zone, emanating from fissure 8 and heading toward the geothermal plant. It seemed quite possible that the plant would be obliterated as lava encroached on the plant’s land. Soon thereafter a warehouse with a drilling rig and a substation were lost to the advancing lava; three of the production wells were covered. But on May 29th the flows shifted to the north, cutting the access roads to the geothermal plant but bypassing the main facilities of the plant. With the main lava flow channel becoming well established on that north side, the plant looked like it might survive. The main plant at Puna Geothermal Venture caught between the original fissure system (at bottom) and the main lava flow channel (at top). Blue Hawaiian Helicopter’s June 2, 2018 photo via the Honolulu Star Advertiser. If you drive down to Lava Trees State Park and go past the turn a few hundred feet, you find the western corner of PGV’s land, from where you might think the plant doomed. Lava more that 60 feet thick lays across the roads that used to access the plant. 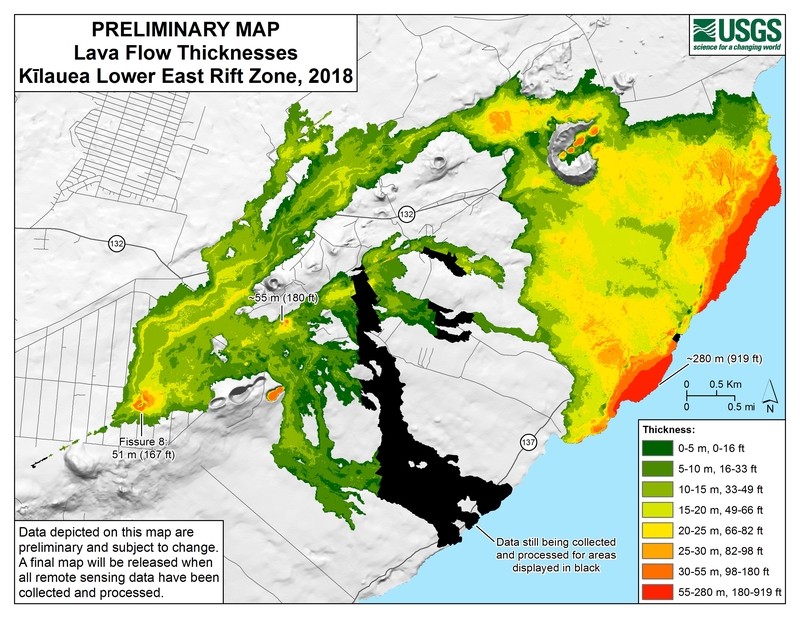 Indeed, the top of the lava levees is about the same elevation as the main plant itself. View down the Pahoa-Pohoiki Road at western edge of PGV land, 3/29/19. View southwest from the same spot up the lava channel to the spatter cone of fissure 8, the main source of lava in the 2019 eruption. Note the downed power lines . And yet, when all seemed to be said and done, although more than half the land of the Puna Geothermal Venture was under new lava, the main plant had survived. However, estimates in the media suggested it would be years before the plant could be reopened; indeed, it seemed possible that local opposition might shut the plant down permanently. So GG was a bit surprised to first see ATVs and pickups going up and down over the flow and then hear from a local who stations himself near the road closures that the plant was about to fire up its generators again shortly–in latest March or April 2019, only a few months after molten rock blocked access to the plant. Indeed, those ATVs and pickups were traversing the initial access road that was cut in December 2018, well before the usual six month waiting period for cutting roads across new flows. And checking the local news, indeed it seemed that the geothermal plant was going to be back in operation sooner rather than later with the bonus that the water temperatures are now hotter than before; instead of 2-3 years as originally feared, the plant’s operators plan to produce electricity within 16 months of the end of the eruption. When the geothermal plant west down, the island was forced to restart older diesel generators to cover for the power loss. The state is committed to renewable energy, so retreating to diesel was rather embarrassing, which generally strengthened the hands of alternative energy project advocates. But virtually all renewables generate their share of opposition; GG encountered flyers opposing a new wood-chip (biofuel) plant that touted solar and wind energy, but placement of wind turbines and solar farms have met opposition in some of those places. The geothermal plant, too, has faced opposition ranging from religious objections to the plant’s failure to control emissions of hydrogen sulfide from time to time. If there is to be power, somebody’s ox gets gored, it seems. 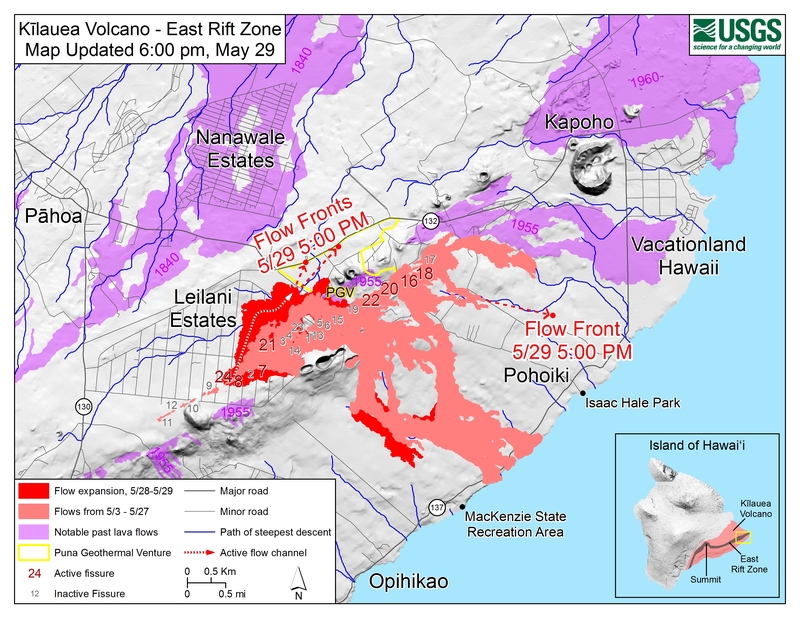 The 2018 eruption was close to the worst case scenario for PGV with active fissures of the East Rift Zone emerging only a few hundred meters from the plant. The choice of the elevated land near the old cinder cones was crucial in allowing the plant to survive, but certainly it was possible that Madame Pele could have opened the rift a bit to the north, swallowing up the power plant. So just maybe she approves of this use of her fires. Just a quick pointer to a real rarity–an op-ed on oil and gas development that seems firmly based on fact. The Boulder Daily Camera weighed in on the rather ridiculous forced pooling laws in Colorado (the next time some oil and gas advocate claims that Colorado is the strictest state in the country for development, remind them about Colorado’s forced pooling laws, which are the nation’s loosest). As a quick reminder, forced pooling means that your minerals can be developed against your wishes; GG discussed this at somewhat greater length awhile back. In some states it takes 50% or more of the rights holders to trigger this. In Colorado, it is a single rights holder. In some areas, oil companies have canvased neighborhoods looking for one resident willing to sign over development rights, which would unlock the whole area. Well, election season is upon us and as sometimes happens, frustration with legislative gridlock has produced initiatives that probably are less than ideal solutions to problems. Here in Colorado the issue is oil and gas development. Generous forced pooling rules, state control of drilling permits, and limitations on the ability of surface rights holders to prevent drilling have frustrated suburban dwellers who object to the various nuisances and impacts of a booming oil and gas industry. Attempts to limit development in town laws have been struck down by courts, and attempts to pass legislation have also failed. Compounding the insult has been the explosion of a house in Firestone because of a feeder line from a well that wasn’t properly shut off. So opponents have gone to the ballot box with an initiative that would force new oil and gas wells to be a half mile from any occupied dwelling or vulnerable areas like reservoirs and rivers and streams. There is no opportunity for a surface rights owner to waive the setback, but this would be a statutory change and not a constitutional change. For those of us concerned about increasing CO2 values in the atmosphere (yes, we are about to crash 410 ppm), the recent decision of the Trump administration to back out of the Paris accord is disheartening. But it is worth looking at what has been going on for awhile to see that there is progress, much of which owes less to government action than to the power of the marketplace. Let’s start with a recent milestone: 10% of electricity produced in the US in March was from wind + solar energy. That’s produced, not capacity. Now wind in particular is seasonal, so we’ll drop back down from that high, but compare that to the high from 2007, ten years ago, when it was only 1%. This is excluding other non-CO2 sources of electrical power, such as nuclear energy, hydropower, and geothermal. Of the 97.4 quadrillion BTUs (or peta-BTUS, or PBTUs; equal to 2850 GWh) of primary energy consumed in 2016 (so not just electricity), 18.5 (or just a hair under 20%) came from all carbon-neutral sources of energy. Going a decade back on primary energy consumed reveals some interesting changes–and lack of change. Total energy consumption was actually higher at 99.4 PBTUs, but carbon neutral was only 14.9 PBTUs (nearly all nuclear, biomass and hydroelectric, in decreasing order). One of the great accomplishments that goes unnoticed is that GDP in the US in constant 2009 dollars went from $14.5 trillion in Q1 2006 to $16.9 trillion in Q1 2017: a 17% increase while energy consumption overall dropped by 2%. That is huge, because if energy tracked GDP, the increase in renewables would have not even filled in the hole in increased consumption of energy. U.S. energy consumption has been flat or gently declining since 2000. Of course you might say that the low-hanging fruit is picked, and there is reason to think that. Hydropower isn’t going anywhere forward in a big way, and decreased flow in important hydropower rivers like the Colorado bodes ill for the future. Nuclear remains stalled, and the impending retirement of a number of plants suggests the share of power from this source will decline. But there are optimistic trends, too.